One theme of this week's website update is "VIDEO." 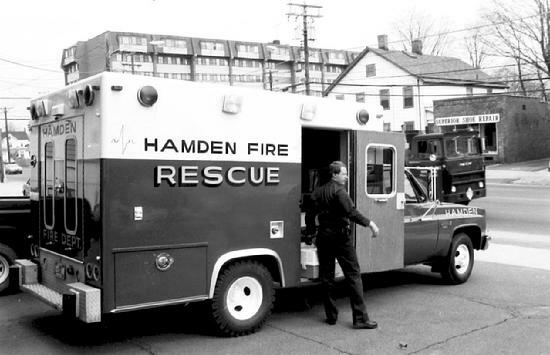 Coincidentally, two video "firsts" for the Hamden Fire Department occurred within days of each other 30 years ago this week. 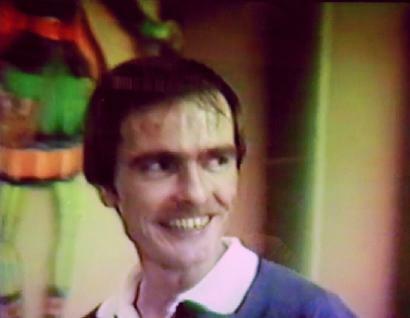 October 29, 1982: Firefighter Gerry Dinneen Brought the Hamden Fire Department into the "Video [Tape] Age"
30 years ago this week, on October 29, 1982, Hamden Firefighter Gerry Dinneen captured the first "modern day" video of a Department function, the 1982 Co. 7 Halloween Party at Station 7. This seemingly inconsequential event sparked an interest by Department brass in the use of video as a means of documenting department events as well as its potential as a training tool. During the next three years, Gerry taped a number of department functions, including the Department's first Awards Night in 1985. The Department suffered a tremendous loss when Gerry passed away suddenly later that year on Christmas Day. 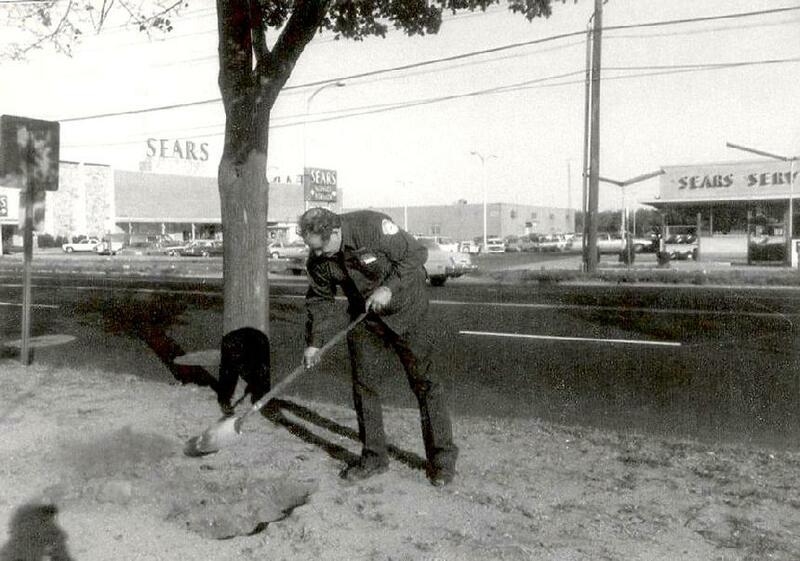 In his brief career with the HFD, Firefighter Gerald Dinneen made a difference. When three Branford teenagers got lost after dark on Sleeping Giant State Park, HFD's Mountain Rescue Team was called in. 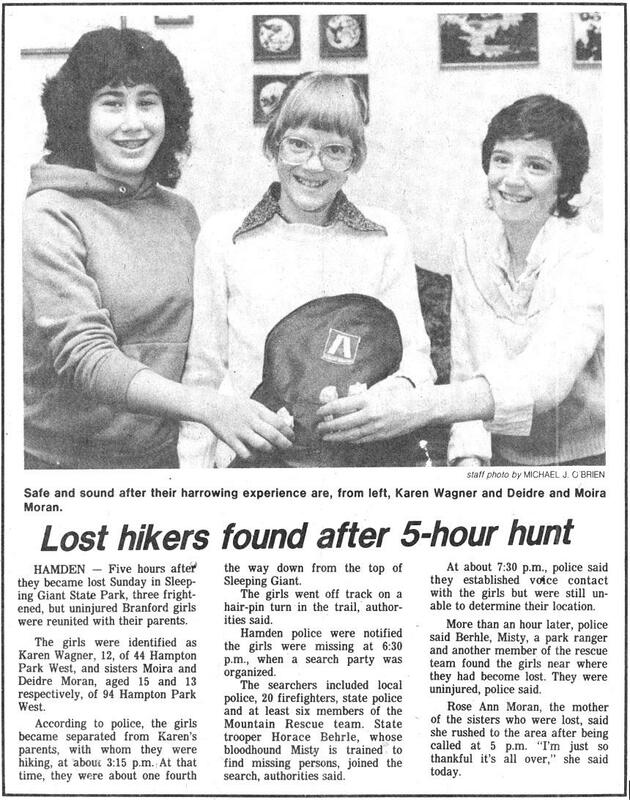 Fortunately, the kids turned up after police dogs located them only a short distance from the ranger station. WTNH Channel 8 News covered the incident. Several of the Mountain Rescue Team members, including Chick Manware, Tony Melillo, John Tramontano and Ed Charbonneau, can be seen in the news report. on the weather - and stay safe! This is a perfect time to remind you, it is still hurricane season. Emergency managers have been keeping a close eye on Sandy, saying that by early next week it could miss the New England region entirely, brush by it, or slam directly into it early next week. Experts believe the area will not go unscathed. A direct-hit scenario would have “huge implications” in New England, the Weather Service said in a forecast discussion posted Wednesday. Even if Sandy only makes a “close pass” it will likely impact the New England region with strong winds that would topple trees, causing widespread power outages, storm surge, and coastal flooding. · Check your family’s emergency supply kit – make certain you have food, water, medications, and other necessities to sustain you, your family and family pets for at least 72 hours. · Follow the direction of local officials –evacuation orders may be issued by officials, so follow their guidance. When it comes to swimming, follow local warnings as well. Even the best swimmers can fall victim to the strong waves and rip currents caused by storms. · Keep up to date with local conditions – follow TV and radio reports from your area, or visit www.weather.gov (http://mobile.weather.gov on your phone) for the latest forecast. · Remember food safety – power outages and flooding may happen as a result of a tropical storm or hurricane, so have a plan for keeping food safe. Have a cooler on hand to keep food cold, and group food together in the freezer so it stays cold longer. · Have an adequate communication plan - be sure friends and family know how to contact you. Teach family members how to use text messaging as text messages can often get around network disruptions when a phone call can’t get through. Keep in mind, hurricanes bring heavy rains, storm surges, and possible flooding events. Avoid walking or driving through any flooded areas – it takes only six inches of fast-moving flood water to knock over an adult and two feet to move a vehicle. Remember: Turn Around, Don’t Drown! Local 2687 President Kurt Vogt invites all Hamden Fire Retirees to join Local 2687 members in welcoming IAFF General President Harold Schaitberger, who will be stopping in at Hamden's Station 3 next Wednesday, October 31st at 10:30 a.m. President Schaitberger's visit is part of a two (2) day swing through Connecticut designed to let members hear from the State and National leadership. The Local is planning to have sandwiches and refreshments for everyone, so if you expect to attend please contact Kurt (hfdr1@sbcglobal.net) or Dave Johnson (hfdbadge102@aol.com) so that the Local may have an approximate head count. The visit to Station 3 by IAFF General President Harold Schaitberger, originally scheduled for Wednesday, October 31, has been cancelled due to the expected severe weather. The Hamden Guardian Services Retirees Association, LLC (HGSRA), an organization formed recently by retired Hamden cops and firefighters to oversee and protect our pensions and benefits, is now a legal entity in the State of Connecticut. (NOTE: This is NOT the same association as the HFRA, Inc.). 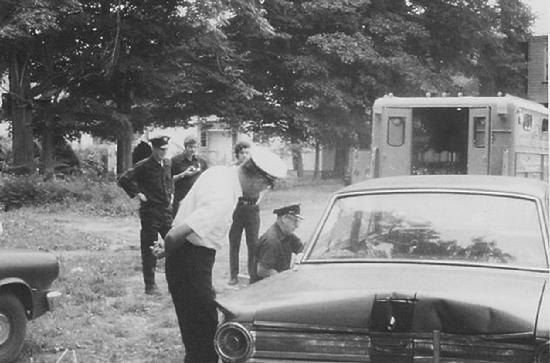 We recently contacted every retired Hamden firefighter for whom we have an email address or home mailing address*. Information on the HGSRA was provided along with an application form. If you did not receive the notification and application form please contact this website right away (HFDBadge102@aol.com). Over 140 Hamden fire and police retirees have joined the HGSRA as of October 26th. 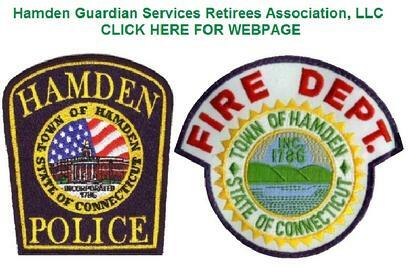 The Hamden Fire Retirees Association, Inc. (HFRA), is pleased to provide a page for the Hamden Guardian Services Retirees Association, LLC on this website for informational purposes. See menu tab "HGSRA" Please be sure to check it frequently, particularly during the next few months. A meeting for all new members of the Hamden Guardian Services Retirees Association, LLC will take place on Thursday, November 15th at 7 p.m. (location TBA). All members as of that date, or those retirees who plan to join at the meeting, are welcome. The Executive Board of the HGSRA will report on the status of the pension plan and on future HGSRA activities. A specific meeting agenda and the location of the meeting - we are looking into several possible locations - will be posted on the HGSRA page of this website and sent to all HGSRA members as the meeting date nears. *Confidentiality regulations prevent the Town from disclosing addresses of retirees. Does anyone know how we may contact retiree Thomas Hart? We also have a California address for a Roger Sulllivan, but we're not sure he's our retiree. Mail delivered to old addresses is often discarded by those presently living there and not returned to the sender.